For over 15 years email marketing has been cost effective, efficient and easy. However, an Epsilon Study published in the Huffington Post revealed that, “65 percent of those surveyed ‘strongly agree’ that they get too much email, and 75 percent say they get a lot of emails they never open.” This creates a problem whereby emails that may be relevant to customers’ specific needs are being ignored. Gmail, for example, has built in automated sorting that separates a user’s primary inbox, social inbox and promotions inbox. Often times, emails that are automatically separated into these new inboxes are not seen by the end user. In addition to the automated email sorting, technology built into Gmail eventually learns user preferences and habits of opening and reading emails, which creates an environment that makes it tougher for the user to see, let alone open an email. 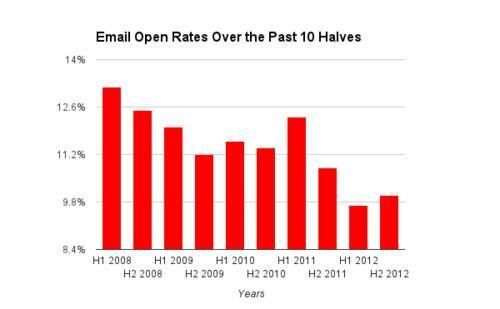 With email effectiveness and open rates declining, (see chart below), vendors need to look for additional marketing options to provide to their channel partners. To help them differentiate their businesses from competition, channel partners need access to multi-touch marketing campaigns which include tools such as webinars, social media, adword campaigns, blogs, videos or even retargeting. These tactics can help to increase exposure while also giving the end user more of a say in how they consume product information. Direct Mail: Letters sent through direct mail reach prospects in an unexpected and personalized way, since people receive much less mail these days. According to the United Stated Postal Service, 77% of mail is sorted on the same day it is received, a much higher “open rate” than email marketing. Social Marketing: An effective channel marketing program today must include social media marketing. Sending out cobranded posts through channel partners drives awareness, creates buzz, and shares new and exciting trends in the industry. Plus, helping partners engage with their consumers on social media creates an ongoing conversation that is both valuable and personable. Webinars: Webinars are an efficient and highly effective method of demand generation but are generally too time consuming for partners to run on their own. Webinar syndication offers the vendor the opportunity to create and run the webinar, but then to enable the partners to invite their customers through private label invitations and landing pages. This tool keeps the brand in front of the customers and allows a brand expert to present, while operating under the name of the local partner. Although email marketing is still an important tool for a company to utilize, it cannot be the only marketing technique a company relies on. Employing a multi-touch campaign can open doors that were previously closed due to a one track marketing campaign. At StructuredWeb, we offer 15 different ways to market through your channel, including email marketing, direct mail, retargeting, social marketing, and syndicated webinars. If you are interested in expanding your channel marketing capabilities, please visit our website, www.StructuredWeb.com or call us at 800-399-3711.